Chicago Wolves' rookie goaltender Ondrej Pavelec credits changes to his diet that helped him get his body into better playing shape. 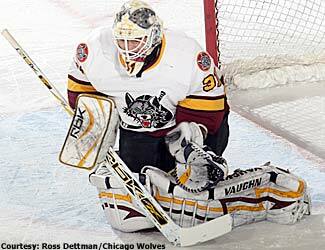 Chicago Wolves defenseman Boris Valabik calls it his babysitting job. The team has another description -- being a roommate and mentor for rookie goalie Ondrej Pavelec. "I have this guy," Valabik joked. "It's going to be difficult for him once he lives on his own because he doesn't know how to do anything yet. I pay the bills. If anyone cooks, it's me." It takes a team to help raise this young goalie from the Czech Republic, and it behooves the Wolves to do so. Now, they have his back. Come playoffs, Pavelec must have their's. The Wolves are running away with the West Division on the back of an offense that leads the AHL with 226 goals. Don't be fooled. That scoring machine is emboldened by the developing talents of Pavelec, 20. And come the postseason, his maturity and pressure-tested coating will play even larger parts in the success or failure of Chicago. "Put it this way," Chicago assistant coach Wendell Young said. "We're a lot more offensive because we have a good goalie. You can take a chance with that pass, do stuff. We know Ondrej's back there. He's been our best player in the past month." How good? Swallow these stats. He's registered a 10-1-2 mark over his last 13 games, holding rivals to just 17 goals (379 saves on 396 shots). Pavelec, 25-9-2, 2.56, .917 overall, was the league's goalie of the month for February. Oh, and apparently he's a pretty good actor as well. "I try to not be nervous. But sometimes I am nervous before a game," he said. "I can't show the team I'm nervous. I'm easy, nothing, no trouble. I just try to be positive. I like to play under pressure. That's why I'm the goalie." There's a bit less of Pavelec these days, which is why there's more to love about his game. A second-round pick by Atlanta in 2005, his transformation from prospect to performer began when he started to get a little lighter on the scales last year. He's about 6-foot-2, 195 pounds now, but Pavelec admitted that during the past two seasons with Cape Breton of the QMJHL he pushed the 220 mark. North American junk food was softening him up quite a bit, until he decided to kick it aside like a wrister from the blue line. "The important thing was eat properly. No McDonalds, Subway or Wendy's," Pavelec said. "No ice cream. Everybody likes that, but I have to be careful. It (overeating) was a big mistake. They told me it was a bad thing. I started to eat properly." Pavelec felt the dramatic results almost immediately. Instead of being a solid netminder for two periods, he was a steady, reliable one for three. "I think I am ready for three periods, plus overtime or shootouts," he said. "I was so tired after the first period (before). I can make a big save in the third period to save the game. It's hard to be focused all 60 minutes if you are tired." With his body thusly tuned up, Young went to work on his mind and mechanics. Pavelec wasn't quite as large any more, but Young implored him to play that way. He tinkered with the rookie's posture and told him to stop dropping his shoulder, a quirk that made him play small. Sometimes, Young just sat back and marveled at what Pavelec brought to the table on his own. Young compared him to ex-Wolve and current Thrashers goalie Kari Lehtonen in terms of his large blind spot when it comes to failure. Of course, it helps that Chicago as a team isn't real familiar with that concept either. "If you win the game, you feel more comfortable. If you have a bad game, you lose a little confidence," Pavelec said. "A lot of people fear failure," Young said. "When these goalies feel like they can stop the puck, it's a huge thing. Win or lose, he just goes along and plays the game. He's got a great personality. That's only going to fast-track him to the NHL. I think Ondrej is a lot more mature beyond his years." Pavelec's real-life skills aside, Valabik marvels at the same thing. "You know what? The save that he makes at the key time of the game, it's not what a young goalie usually does," he said. "He doesn't get frustrated. I don't see him as a young goalie at all. The only time we talk about him as a rookie is when he has to pay for something." Pavelec shouldn't have to worry about tabs much longer. He's earned seven games with the Thrashers already, going 3-3, 3.11, .905. He's also helped create something of a sleepy workforce back in his hometown of Kladno. Pavelec's parents, and doubtless other family members, watched his Atlanta games on the Internet. With the time difference, that was roughly a 1:30 a.m. faceoff Czech Republic time. His mother, a nurse, would sign off the computer at the end of the game and, instead of trying to catch some Zs, simply went to work. "She was happy, but she said she was almost sleeping at work," Pavelec said. "It was so exciting for this time, so it was all right." Everybody in the Pavelec fan club, his teammates included, better rest up. He's looking like he has a lot more games left in him this season. So, too, do the Wolves. That mix promises a postseason of wide-eyed moments, both predictable and unforeseen. "I know we can score the goals. But I know I have to stop every shot. You never know what's going to happen," Pavelec said. "Everything is good now. But the playoffs are soon. I know it's going to be different. It doesn't matter how old you are. It (winning or losing) is going to be about one mistake. We'll see."